Acapulco Yacht Charters – Yacht charters in Acapulco has a reputation. That reputation portrays a city that never sleeps and Acapulco does it’s best to live up to that reputation. Nightclubs and discos don’t close until every last reveler has gone home, at times this is long after the sun has come up. Legendary nightlife aside, Acapulco also has a reputation of being a magnet for the rich and famous. 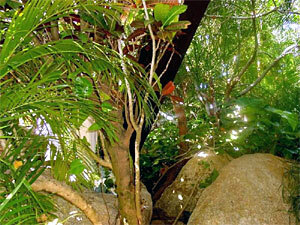 Many celebrities, from all over the world, have homes or keep vacation retreats in Acapulco. Keep your eyes open, as you never know whom you will see in this lively city. Acapulco is a diverse city that offers the many benefits of a large city with a population of over 2 million, yet in many areas of the city Acapulco retains the feeling of a small town. The first thing that comes to mind, for many people, when they think of yacht charters in Acapulco, is the incredible bravado and the daring feats preformed by the La Quebrada cliff divers. These divers are famous the world over and are definitely a “must see” when visiting Acapulco. 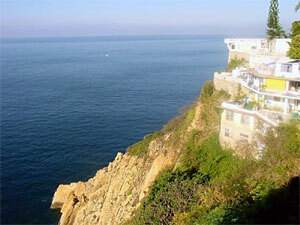 Acapulco is situated around a horseshoe shaped natural bay, with hills and cliffs on either side. Each side offers incredible views of the entire bay, the city and all of the beaches within the bay. Many of the restaurants, bars and discos are located to take advantage of these incredible views. The view of Acapulco at night has got to be one of the most incredible scenes in Mexico. 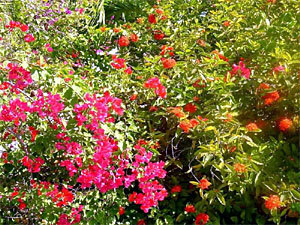 Acapulco is a great vacation destination if your children are going to join you. Apart from the beaches and the normal beach related activities there are many attractions to keep the younger set busy. CiCi, located on Av. Costera M. Alemán, at Playa Icocas, is a water park featuring water slides, water toboggans, dolphin encounters, seal shows a wave pool and Sky Coaster, a ride that will leave youngsters and grownups alike screaming. Mundo Marino is an aquarium and fun center, located in between the little beaches known as Playa Caleta and Playa Caletilla and features indoor and outdoor marine exhibits, water slides, water sports, restaurants and gift shops. 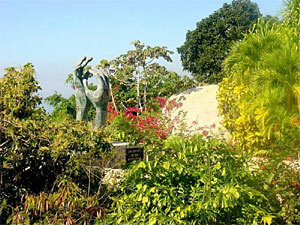 Parque Papagayo, is a huge park located on The Costera, across from Playa Hornos. The park is filled with carnival rides, go-karts, roller skating rinks, skateboard courses and many other attractions. The two major malls both have many diversions, such a video game rooms, for the younger set, so that the parents can shop while the kids amuse themselves. 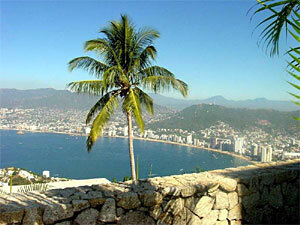 Acapulco is a city that gives you many choices when it comes to beaches. During the day most of the focus in Acapulco is on the beach. The theme in Acapulco seems to be Party All Night and Play on the Beach All Day. The whole bay is lined with beaches, we will cover a few of them; you can check them all, time permitting, when you visit. Many of the beachfront restaurants will put umbrellas, chairs and tables in the sand so you can enjoy your food or drink right at waters edge. Playa Diamante and Playa Revolcadero, south of town near the airport are areas of major development. 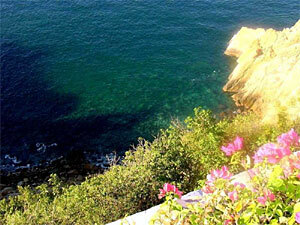 Four of Acapulco’s golf courses are located in this area, along with some serious resorts. Water sports of all kinds, waverunners, ultra light airplanes and horseback riding are available here. This long stretch of beach is open to high waves, so be careful if you are not an expert swimmer. Because of the waves this is a great area for surfers as well as beachcombing and collecting a few shells. Playa Puerto Marques is part a fairly large bay that is a favorite with locals. The entire beach is lined with tin roofed restaurants serving up fresh seafood, cold beer and tropical drinks at prices that are usually below those of Acapulco proper. The calm waters are great for swimming and water sports, when there is room. This beach is busy every day and is very, very crowded on weekends. Playa Icacos is a calm beach, toward the southern end of the bay, lined with high-rise hotels and condominiums. This beach has all of the local watersports available directly from shore. This area also is the home of the giant CiCi water park and very close to much many of the discos. Playa Condesa, in the heart of “Zona Dorado” or “The Golden Zone” is one of the most popular of the city beaches, with many beachfront restaurants and a lot of activity. Playa Condesa is also where much of the “pre” nightlife originates, and is very close to many of the better restaurants and shopping centers so that you have a choice of other things to do should you become bored with the beach scene. Playa Condesa is also the home of the giant bungee jumping attraction, Paradise Bungy, which always draws crowds of onlookers, along the sidewalk and adjoining restaurant. The crowds are there to watch the brave jumpers, which sometimes get dipped in the giant swimming pool, far below the jumping platform that is situated 165 feet in the air. Playa Caleta and Playa Caletilla are two small beaches, located away from most of the tourist traffic. These small beaches combine calm waters, great atmosphere and many beach front restaurants that serve some incredible seafood at reasonable prices. Many of the beachfront restaurants are shaded by giant trees which add a different feel to beach going. In between the two beaches is the Mundo Marino aquarium and fun center. These are both great family beaches which get very crowded on the weekends. There are many more beaches in Acapulco, to the north the Pacific beaches of Pie de la Cuesta and the protected beaches of the Coyuca Lagoon, offer more diversion. Rest assured that you will find a beach in or near Acapulco that will suit your desire to get out in the sun and enjoy “la playa”. Beach vendors work almost every beach and will offer you everything from fresh fruit to cooked fish or shrimp and temporary tattoos. You can also have your hair braided – Bo Derek style on almost any beach in Acapulco.